In a scenario where there are many transactions to run and you do not want to perform every transaction manually, the Transaction Center has a feature to perform a Batch Upload. This takes a CSV file formatted specifically for the 1stpaygateway gateway with information on the transactions and processes them. Click 'Choose File', which will open a dialog to select the file. 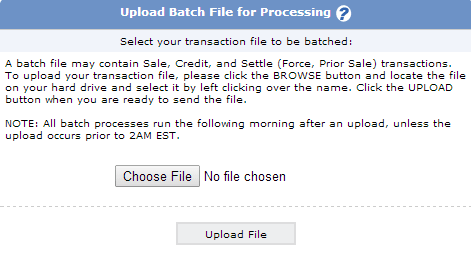 Once the file is selected, clicking 'Upload File' will start the process to upload the transaction data in the CSV file. This properly identifies what kind of transaction is being ran (a sale for a card). It also properly gives an order ID. Then the amount is specified, followed by card information. After customer card information there is the option to specify when the transaction is to be closed in MM/DD/YYYY form. Finally, a recurring type may be entered if this order is meant to begin a recurring transaction for the customer. 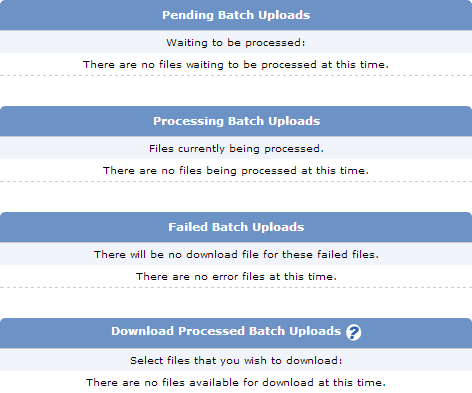 When the information has been processed for the uploaded file, you can view the status of the upload and a file can in turn be downloaded giving the results of the uploaded. This can be viewed at Virtual Terminal Batch Download Transactions.